What UX features should organisations look for in a UCC solution? There’s no doubt about it, the workplace – and workplace devices and communications tools – have changed dramatically over the last few years. A decade or so ago, business users were forced to work with what they were given by their employers. An office PC was usually a given but sometimes – if you were one of the lucky ones – you were also granted a work mobile phone so you could make calls, send texts and do business on the go. Today however, we live in an age in which people want to choose their own devices and applications and personalise their work-related communications experiences. Workers have come to rely on the plethora of communications tools available to them in their personal lives, from Facebook Messenger to WhatsApp, and they want to bring their preferred consumer tools and the high-level user experiences which they are accustomed to; into the workplace. As organisations look to deploy a Unified Communications and Collaboration (UCC) solution, they must keep in mind that – alongside taking steps to ensure security and compliance – delivering an exceptional user experience is key for achieving user satisfaction. Giving your workforce the same high level user experience that they get when they use a consumer application or platform can help to keep them engaged while they are on the job. This in turn can help to drive business goals and revenue. In short, organisations must choose UCC solutions with the needs and demands of the end-user in mind – how they do their jobs, where they do their jobs, what tools they use and what they’re trying to achieve. Simplicity is key. Everyone is after a seamless experience. One way in which UCC can help organisations achieve this is via a single user interface. 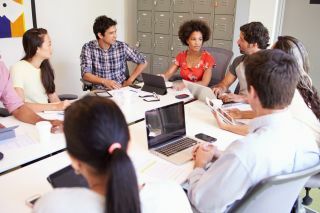 In the past, several ‘collaboration’ solutions involved disparate products that didn’t unite screen sharing, messaging, voice, and other communications services. However, in my opinion, true collaboration can only be realised when all of these technologies are brought together in a single, accessible, user-friendly place. To illustrate, rather than having multiple communications infrastructure vendors with various clients, everything should be integrated into one common application that works seamlessly across all of your mobile and fixed devices. Take it one step further. And why stop there? You can make life even easier for your workforce by adopting solutions that support Threaded Communication. This approach gives the history of all communications quickly and easily in one single, easy to read thread, tying everything together neatly for users, so that they can collaborate across different interfaces and platforms without any hassle. The power of choice. Having a single interface doesn’t mean that your workforce will have limited choice. When it comes to user experience, the more options that a solution grants your workforce, the more empowered they feel. A UCC solution should be able to cope with end user preferences for different device types, platforms and operating systems. Your employees shouldn’t be forced to give up their favourite communication tools. Instead, find a solution that supports and enhances them. Going Beyond. Leveraging user metrics will help drive better decisions to further support the user experience; workers will want to jump between multiple devices –whether it be phone, desktop or tablet – over the course of the working day, and your UCC solution should be able to support this behaviour effortlessly. In addition, workers will inevitably move to and from their cellular networks to multiple Wi-Fi spots whilst out on the move. It’s critical the solution doesn’t drop calls or any other aspects of its performance be affected when switching between different forms of coverage. So once you find the right solution for your organisation, what’s next? How do you ensure the solution delivers on expectations? Don’t get off on the wrong foot. A coordinated, process-driven approach to the new UCC implementation is the key to delivering a positive and fulfilling experience. You could develop workforce profiles based upon user roles and perform a needs analysis to ensure everyone gets what they need from the solution. Then, conduct an assessment of your existing network infrastructure and legacy systems, to get an idea of what’s required to get everything up and running correctly. This information will help you develop an efficient, effective strategy for design, testing and rollout. Be committed. Once upon a time, a UC deployment would involve all matter of pre-configuration, equipment inventories, physical connectivity, phone installation and verifications. Today, if you’ve opted for a solution with a good level of interoperability, things are a lot more straightforward. However, careful planning is still required to ensure seamless migration. After the implementation is complete, don’t stop there; ongoing monitoring and management to ensure reliability and quality is critical to the ongoing user experience for workers. Get users excited. Training plays a crucial role in accelerating adoption and ROI. If you’re going to tempt employees out of ungoverned shadow apps, you need to educate users about the value of the solution, how it can help them do their jobs and what organisational goals can be achieved. Different user groups will likely require different types of training to get them up to speed on system functionality and how it’s related to specific tasks. Who knows what the workplace will look like in ten, even twenty, years time? It’s an ever-evolving machine. But one thing’s for sure; communication and collaboration will always be an essential part of doing business. And nowadays, a new generation of digitally-savvy employees expect more from their employers than ever before and – even better – they’re not afraid to ask for it. Business leaders urgently need to listen to and try to accommodate their demands if they are going to leverage user experience to drive productivity and get the upper hand over their competitors.